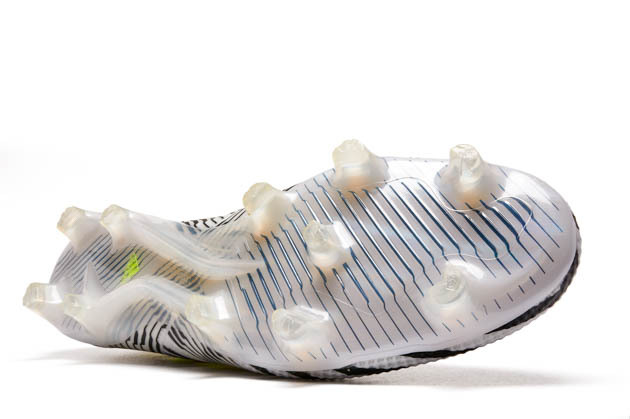 When a boot is released that causes all boot nerds and players alike to stop and take notice, that is when a cleat is guaranteed to truly get me excited. 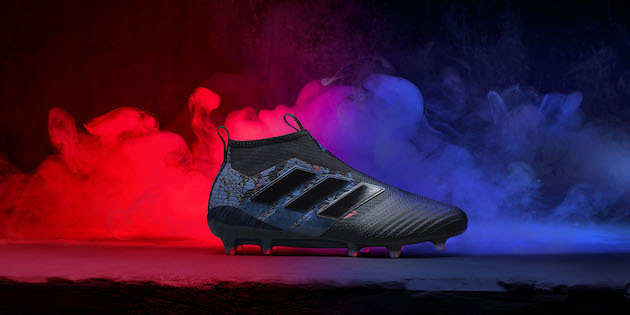 The adidas Nemeziz 17+ 360Agility is only the second truly laceless boot silo adidas has released to date, with the PureControl of course being the first. The new silo takes the place of the now defunct Messi line of boots or PureAgility cleats. The Nemeziz is the laceless option for players with thinner and more narrow feet compared to the PureControl that was generally made for wider footed players. As far as first impressions go, the Nemeziz makes about as good of an impression as any boot I have ever tested. Getting it in hand you can’t help but notice the striking design that pops even with only Black/White/Safety Yellow on the entire boot. Touching the boot you can feel the AgilityTape that wraps nearly the entire not apart from the toebox and bottom of the heel area. It is especially stretchy and soft around the top of the boot in order to make it easier to slip on and off. 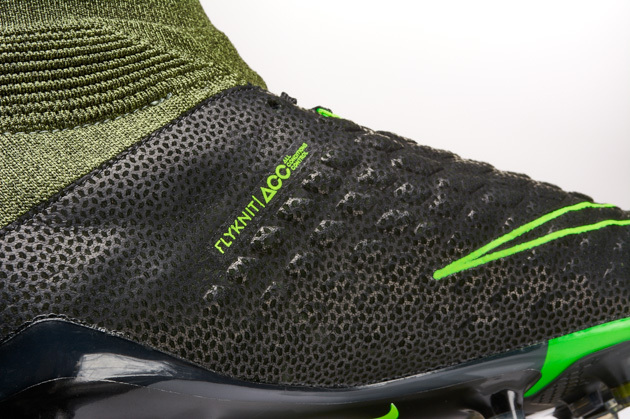 The tongue is non-existent in order to make this a true laceless boot, and to aid in giving a more personalized fit for players who may have slightly wider than average feet (subtle call out of myself). The colorway has received some updates since I received the boot and stated testing it so for sake of this review, I will be referring to the launch colorway and just the silo’s look in general. As I mentioned previously, the launch colorway was made in a White base with Black lines running the entire boot. Online photos and videos do not give the Nemeziz as much credit as it deserves in person. In hand and on feet, it is a silo that not only stands out, but becomes one of the best looking boot on pitch. 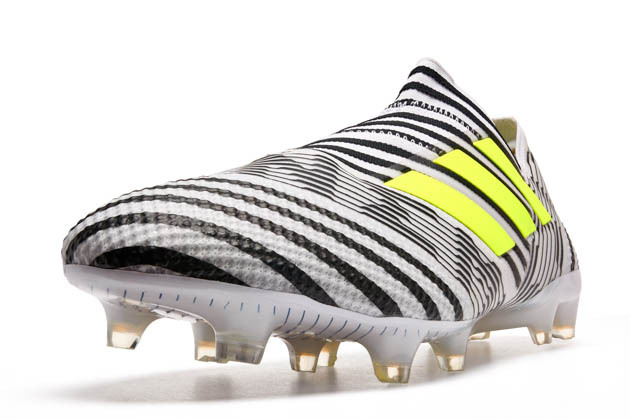 Performance in the Nemeziz is easily narrowed down to one word; outstanding. 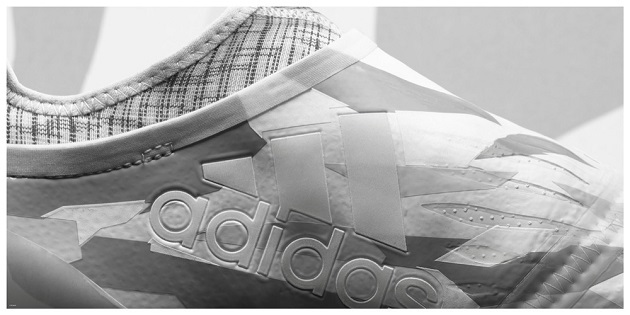 The laceless technology on the inside of the boot along side the 360 AgilityBandage, lock your foot in place. I was skeptical that I would slide around in the boot or would not have as much lock down as I normally have from a laced option of a boot, but the Nemeziz 17+ blew me away on how it locked down. The soleplate is not exceptionally wide, but I had zero issues in my normal size and found the cleat to be very comfortable while playing both in game, and in training sessions. The soleplate is classified only as an FG so using it on AG surfaces is a risk, but I trained on an AG surface for a few sessions and there are no visible signs of wear and tear or rips in the upper. So while I wouldn’t recommend using the boot on AG, it seems to perform very well on the surface. On in the inside of the boot, there are tiny grip elements that grip onto your sock to prevent slipping during play and they work to perfection for me. You don’t notice them while playing, but the extra bit of security to prevent slipping is a much-appreciated added touch from adidas. The heel liner is extremely padded to prevent any discomfort in the heel. The shape of the boot on the collar is an interesting design with a sharp cut downwards that takes some time to get used to. At first, I felt some rubbing on my ankle as it was not used to having that sort of design there. During the course of my testing however, I did not have this problem again. For those of you worried about lockdown, don’t be. The shocking/most wonderful part of this boot is the lockdown and fit you receive. Now make sure you get the correct size or it wont matter how it fits. The way it fits out of the box is about how it will be for the entire time, granted there will be some stretching in the knitted material in the toebox. The 360 Agility Bandage does the job in terms of comfortable lockdown with the bandage taking up the entire cleats upper with some NSG grips and some protective elements on the high wear areas. 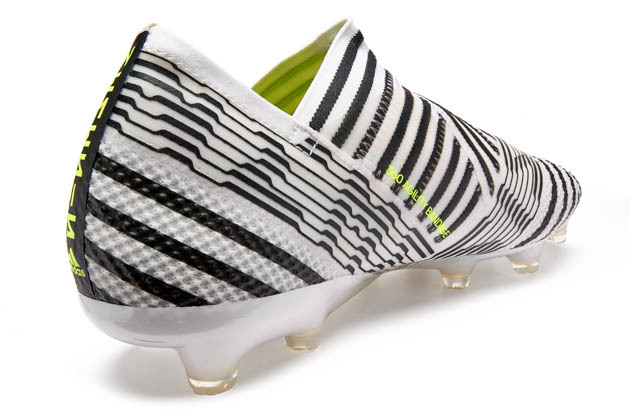 The toebox is made entirely out of Agility Knit and it is without a doubt one of the best parts of the Nemeziz. The upper is thick, but thick enough to have any complaints. When striking the ball or controlling it, the boot gives a layer of cushion to allow the ultimate touch, while also giving a thinner feel compared to that of say a Tiempo or any leather cleat. The new soleplate dubbed TorsionFrame is a simple one with half moon shaped studs strategically placed under the toes. Four studs are placed under the heel to lessen stud pressure when playing. I never had any pressure issues, slippage, or any issue with grip while playing. While it is not as great as a Tiempo soleplate but it is one of my new favorite soleplates I have played with. If you are wondering who is wearing the Nemeziz, you can most likely find a player on your favorite club’s team with a pair on. The big man himself Leo Messi is the headliner of the boot but he opts for the laced version. Roberto Firmino and others wear the laceless version. Without a doubt adidas have turned a Nemeziz skeptic a believer. I was not only worried about lockdown and fit, but if the upper would even be useful since it is AgilityBandage. After my testing period and up to current day, I can’t stop placing the Nemeziz in my soccer bag. It’s kind of like that song you just cant stop listening too, it’s always on your mind. If you are thinking about picking up the Nemeziz boot, you can head over to SoccerPro.com and check out the selection of Nemeziz cleats. I would highly recommend the Nemeziz to anyone looking for a high end boot for the upcoming season.